Summary: A great hot tub and another great option, this is one of the deepest on the market making it great to relax all the way up to your shoulders. 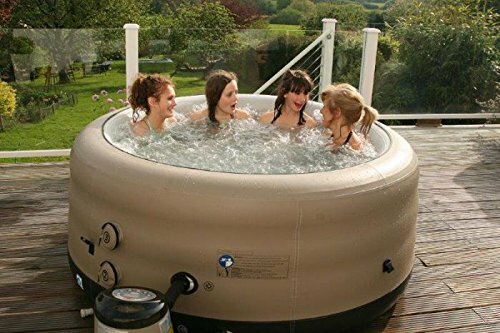 If space is an issue, or you just don’t want a spa dominating your patio then this Grand Rapids Plug & Play Inflatable Hot Tub is worth a look. While it maybe one of the smaller spas on the market holding 2 adults and 2 children, it is however one of the deepest at 29 inches, covering your whole body and shoulders, great for relaxing and soothing those upper body muscles. 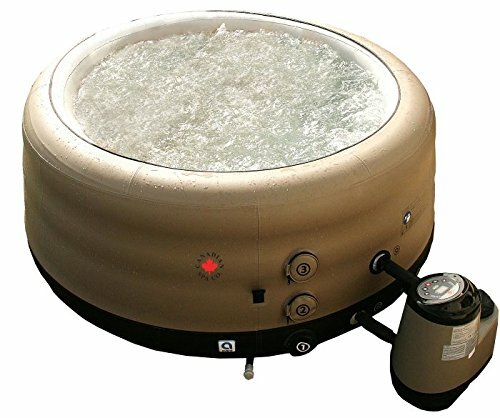 This hot tub comes with 88 air jets, can be plugging into your mains via a plug socket, and comes with a simple filter system that is all inclosed within the heating system for easy maintenance. This spa also comes with a easy to fix on 6 inch inflatable cover that is tapered and lockable for insulation helping to keep the heat in when not in use. Don’t over inflate the black hot tub liner, as it is black the suns rays heat the air and cause it to expand so leave a bit of room to prevent your tub from warping. Our round up of pros and cons for this Grand Rapids Plug & Play Inflatable Hot Tub. Quick to heat – This hot tub can be heated up in 12 hours. Size – Ideal for smaller gardens and also one of the deepest spas on the market. Protection – Comes with a easy to clip on inflatable lid for when not in use. Free delivery – Comes with Free delivery when bought through Amazon. Jets – This model only comes with 88 jets which is at the lower end of the scale compared to other hot tubs.